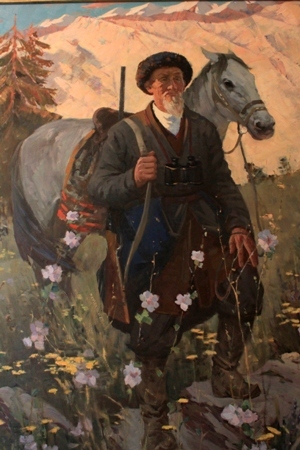 A portrait of Przewalski in the museum; in photographs, he always appeared in military wear..
“Is your country giving you money to travel?” this is one of the most frequently asked questions directed to me in Kyrgyzstan, apart from the usual “where are you from?”, “how old are you?”, and “are you married?”. Initially I could not understand why the Kyrgyz believe that a government would actually provide financial assistance to travelers, not until I visited a museum dedicated to the 19th century Russian explorer Nikolai Mikhailovich Przewalski. Przewalski was a Russian army officer, who made four expeditions to Central Asia under the patronage of the Tsar government between 1870 and 1885. During those trips, he mapped the region of Mongolia, Xinjiang, and Tibet, and brought home samples of rare plants and animals. 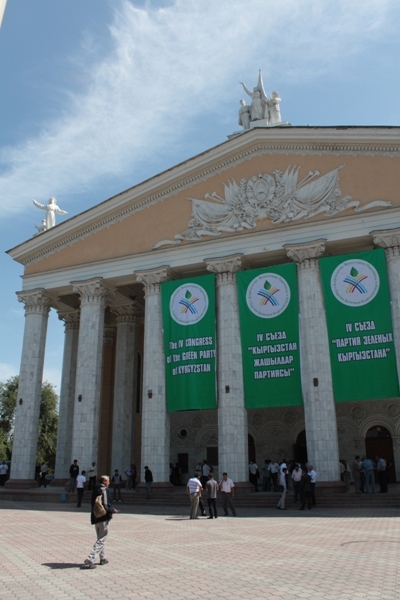 The National Ballet Theater in Bishkek is hosting various political rally this summer. The National Ballet Theater in Bishkek – the capital of Kyrgyzstan – is not hosting any prestigious ballet troupe from Russia this summer; instead, it becomes the venue for local political parties to rally for support. Since the bloodily put down protest in April that overturned the government, sending former president Kurmanbek Bakiyev fleeing to Belarus, the country has been hanging in balance under an interim government while waiting for a general election in October. The yurt - National House of Kyrgyzstan - in the jailoo (grassland). 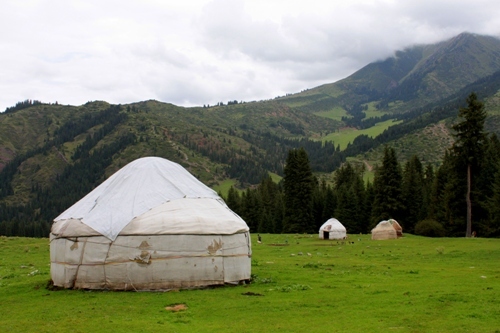 The Kyrgyz people like to refer to anything of local origin as “National”, for example, they call the nomadic dwelling yurt as the National House. They also have National Food, National Drink, National Game, National Costume, National Literature, and of course, National Language. Having gained independence less than 20 years ago in 1991, Kyrgyzstan is a new nation eager to assert its own identity, and shedding the Soviet-Russian legacy. Though the country with five million inhabitants has 80 ethnic groups, the culture deemed “national” is that of the Kyrgyz ethnic, who made up 70% of the population. Other major ethnics include the Uzbek (14%) and the Russian (10%), and the rest are Uygur, Kazakh, Tajik, Belarusian, Ukrainian, Dungan, etc.